Hotel Excelsior offers world-class accommodation and the chance to explore Munich on foot. Utterly charming staff, excellent service, very well appointed room, super comfortable, perfect location. What more could one want? Overlooking the Old Botanical Garden, this 5-star design hotel in Munich offers an exclusive spa with indoor pool, soundproofed rooms with free Wi-Fi, and an elegant Neo Bistro with terrace and bar. The Charles hotel is fabulous. The hotel itself is a true 5* but what REALLY impresses is the level of the people who works there. Thank you for this amazing experience in Munique. I read good reviews about the concierge team, but I can tell, Tim is the BEST concierge I ever met. He made our time in the city even better. Will always be there when back to Munique. Located a 3-minute walk from Munich Central Station, this modern hotel offers soundproofed rooms with free Wi-Fi access, a breakfast buffet, and a 24-hour reception. The staff here were incredible and went above and beyond to help me during my stay. I didn't stay in Munich long but they made my stay one of the most memorable of my entire trip. This historic, 4-star hotel in central Munich offers rooms with free WiFi, and a rich breakfast buffet every day. Marienplatz Square is just a 5-minute walk away. Great location and very polite and helpful staff. Featuring free WiFi throughout the property, Arthotel ANA Diva offers pet-friendly accommodation in Munich. Private parking is available on site. Everything about the place was great. Stylish, clean, friendly staff. Centrally located at the Stiglmaierplatz square in Munich, 800 metres from Munich Central Station, this design hotel features air-conditioned rooms with free WiFi throughout the property. Great location, parking underneath the hotel and a fantastic breakfast with local delicacies. Located in Munich, 1.3 km from Karlsplatz (Stachus), Cocoon Hauptbahnhof features a garden and a terrace, as well as free WiFi. Hotel with it’s “soul” and style. We just loved it! Holiday Inn Express Munich City West is situated in Munich, 1.4 km from Nymphenburg Palace and 3 km from Oktoberfest - Theresienwiese. Guests can enjoy the on-site bar. New and clean rooms, Great breakfast! Featuring simple and contemporary design, Super 8 Munich City North is located just north of Munich's city centre. Enjoy free WiFi access in all areas as well as the stylish bar and a sun terrace. The guys at reception are very pleasant and helpful. 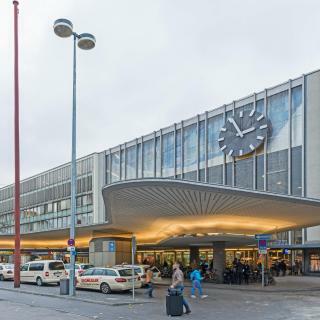 Located just 400 metres away from the S-Bahn Station Laim, Super 8 Munich City West enjoys the central location with the major attractions such as the Marienplatz or the Oktoberfest ground all within... Great hotel, near S-ban Laim station. In quiet neighborhood. This traditional hotel in Munich's Aubing district offers spacious rooms with free Wi-Fi and free parking. 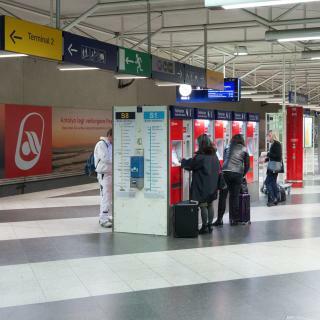 It is only a 15-minute S-Bahn (city rail) journey from the city centre. Perfect location 30 minutes from the center of Munich by train. Featuring a terrace, Holiday Inn Munich - City East is set in Munich. Located in the Berg am Laim district, the property provides guests with access to a restaurant. Everything was excellent, staff friendly and very helpful. Close to public transport. Gambino hotel CINCINNATI offers accommodation in Munich, 20 metres from Fasangarten metro station. Free WiFi is provided. I liked the interior design of the room. Bed was really comfy, bed sheets were nice. Featuring free WiFi throughout the property, Hotel Der Tannenbaum offers accommodation in Munich, 650 metres from German Theater. All rooms come with a flat-screen TV and a private bathroom. Awesome family room - very spacious. Very central position - walking distance to city centre. Mk | hotel münchen city is a 3-star property located in Munich. Located around 1.2 km from Karlsplatz (Stachus), the hotel is also 1.2 km away from Oktoberfest - Theresienwiese. The property has very usable, clean and comfortable rooms. Built in 2016, the 4-star Leonardo Hotel Munich City South features contemporary design with free WiFi and an on-site restaurant. Very good design; comfortable bed, VERY clean, very polite and helpful staff. The Splendid Dollmann is situated in an elegant 19th-century town house in the heart of the historical Lehel district of Munich. Breakfeast was delicious, and the hotel very beautiful. Nice reception, excellent time! This hotel in central Munich offers stylish rooms with flat-screen TV and French balcony. It features a Japanese restaurant and is located beside the Viktualienmarkt, a 2-minute walk from Marienplatz.... Excellent location. A courteous staff. Spacious and clean room. everything is great. This family-run hotel in Western Munich is 400 metres from Nymphenburg Castle and a 10-minute walk from the Hirschgarten beer garden. The Laimer Hof offers free Wi-Fi and free parking. Staff were super friendly and helpful. My room was huge as I got upgrade to the apartment. What hotels in Munich offer an especially good breakfast? For hotels in Munich that serve up a highly-rated breakfast, try BEYOND by Geisel, Hotel im Hof and Hotel Metropol. On average, it costs CAD 147 per night to book a 3-star hotel in Munich for tonight. You'll pay on average around CAD 203 if you choose to stay in a 4-star hotel tonight, while a 5-star hotel in Munich will cost around CAD 483 (based on Booking.com prices). 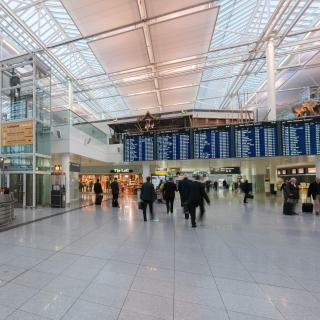 Travellers who stayed in Munich near Munich Airport (MUC) have said good things about Hilton Munich Airport, Novotel München Airport and NH München Airport. What are the best hotels to stay in Munich? Rocco Forte The Charles Hotel, Hotel Torbräu and Motel One München-Olympia Gate are some of the popular hotels in Munich. On average, 3-star hotels in Munich cost CAD 159 per night, and 4-star hotels in Munich are CAD 213 per night. If you're looking for something really special, a 5-star hotel in Munich can on average be found for CAD 518 per night (based on Booking.com prices). What hotels in Munich are good for couples? These hotels in Munich are highly rated by couples: BEYOND by Geisel, Schwabinger Wahrheit by Geisel and Hotel im Hof. The average price per night for a 3-star hotel in Munich this weekend is CAD 304 or, for a 4-star hotel, CAD 389. Looking for something even fancier? 5-star hotels in Munich for this weekend cost on average around CAD 1,037 per night (based on Booking.com prices). Many families visiting Munich loved staying at BEYOND by Geisel, Mandarin Oriental, Munich and Hotel Grünwald. 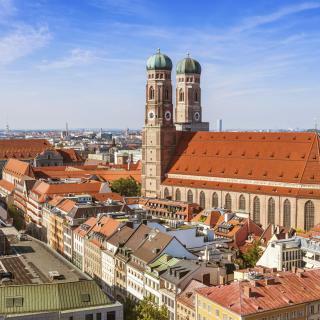 What is the best neighbourhood to stay in Munich? Bogenhausen, Au-Haidhausen and Maxvorstadt are popular with other travellers visiting Munich. What hotels in Munich have nice views? BEYOND by Geisel, Rocco Forte The Charles Hotel and Motel One München-Campus have received great reviews from travellers in Munich regarding the views from their hotel rooms. 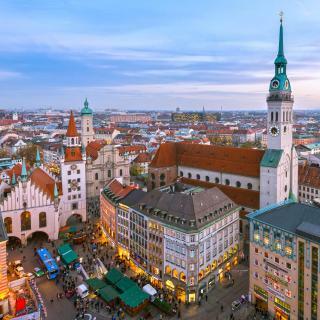 Munich has something for everyone: from historic palaces and castles, to stunning royal avenues to world class galleries and museums. Don't miss the new city hall in the heart of Marienplatz or the former residence of the Bavarian kings, the Residenz. Munich is also home to the world’s most famous beer hall, the Hofbräuhaus. 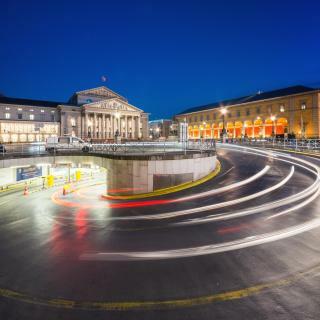 For great shopping, Karlsplatz is another commercial wonderland square that takes up much of the city centre and the upscale area around Maximilianstrasse. Munich is famous for its food too, so make sure you try the local Weißwurst, Leberkässemmeln and other popular pork dishes. 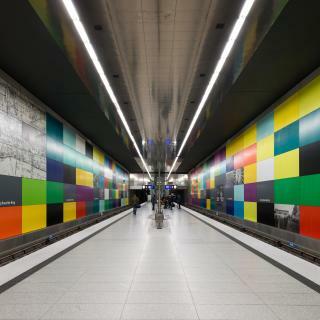 Thanks to efficient S-Bahn train, getting to the city centre from Germany’s second busiest airport, Munich International Airport is quick and easy. Whether you’re looking for luxury hotels, youth hostels or comfortable apartments, Booking.com has the perfect accommodation for your Munich visit. Great city and two days is enough we felt to see all we wanted. 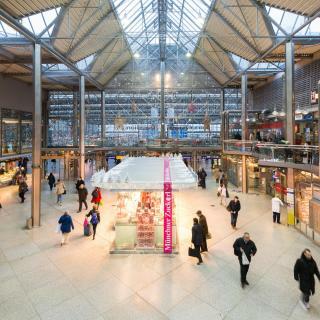 Great transport links for getting around. A gathering of hard drinking homelessness near to the main station was a typical social issue that makes you fell a little on edge in those areas. Felt completely safe the rest of the time. Great beer gardens We went to Dachau. Unmissable in an awful way. 30 mins away. Don’t sign up to a tour. 18 euros train and bus for two people. Easy. Then just walk around and soak up the awfulness that humanity can sink to! Munich is a great city - you could always find a place to see when on a walk. The Old town was beautiful, the beer was delicious and the transportation was really convenient. Would definitely come back again. There are plenty of guides that tell you what to do in Munich, I can give just one tip - don't miss Therme Erding, especially the saunas. I was in lots of saunas in Germany, but this one is a real hit. Munich is really quiet city. Munich is really quiet city. The beer is of great quality (although I'm not the regular beer man). There isn't much to see in terms of sightseeing. The center is nice! It's quite expensive to travel around. Public transportation also seems overpriced. It's not bad for a short holiday - type city break, but I'd rather recommend so many other cities that are cheaper and of higher interest. Get the City Tour Card if you're staying for at least a few days. It gets you on all the public transport and means you dont need to keep paying for separate tickets. The architecture is stunning, restaurants are reasonably priced and food is delicious. The people are very friendly too. Super classy, clean, central and full of good vibes!